Translated into English as "The Catalan Gardens", the luxury camping resort of Les Jardins Catalans is found along the French coastline within a region known as Les Alberes. Thanks to its proximity to the Mediterranean Sea, this camping holiday is defined by agreeable temperatures, immaculate beaches and a host of outdoor activities for the whole family to enjoy. 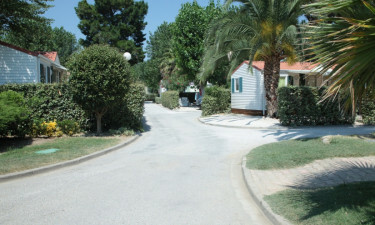 This holiday camping site offers modern mobile homes, 169 private pitches and no less than 5 hectares of space. LUX-camp will be happy to provide further details upon request. Although there is no doubt that the coastline within this region is simply amazing, we should also point out that Les Jardins Catalans offers some wonderful onsite aquatic activities. The swimming pool is open every day between 10 in the morning and 7 in the evening. A large water slide is great for children and on the rare cloudy days, a covered pool is available. The sense of camping luxury to be found here is further enhanced through the availability of modern services and amenities. Wireless Internet is offered throughout the site, as well as within each mobile home. 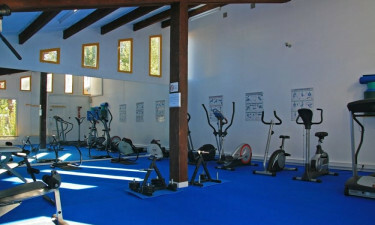 Bicycles can be hired on a daily basis and guests can rent linen. Baby changing rooms and handicapped-friendly facilities can be accessed by visitors, while security lock boxes will store personal items. As should be expected, Les Jardins Catalans hosts numerous sporting activities. Table tennis, tennis, volleyball and boules can be enjoyed throughout the day. During the evenings, live entertainment is provided. This can be a perfect idea for those with children. There is also a large onsite gaming room – another excellent option for both kids and adults alike. 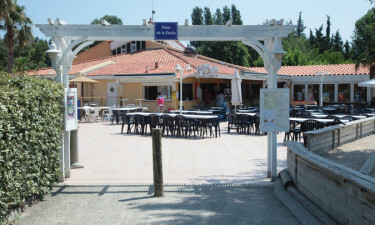 Both the restaurant and the bar are open between May and September. While there is a takeaway menu available, it is always possible for guests to dine in. Regional French foods as well as dishes of a Catalan origin are available. Local wines, international beers and tasty cocktails can be enjoyed. 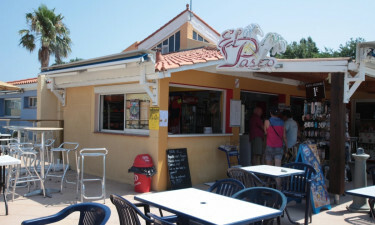 Known as El Paseo, this restaurant-bar is a great option before hitting the beach or after a day at the pool. A convenient grocery store is open throughout the tourist season. Stationery products such as newspapers and magazines are sold here, and there is a superior selection of foods. Fruits and vegetables, meat, fish and frozen products can all be found here. French baguettes and pastries are also offered to those who hope to experience local flavours. Camping essentials, toiletries and cleaning products are only a handful of examples of the items supplied within this shop.